Want to visit a fancy lounge bar and feel the excitement of enjoying a drink in an upscale environment? Rest assured, there are plenty of places you can go in Taipei. 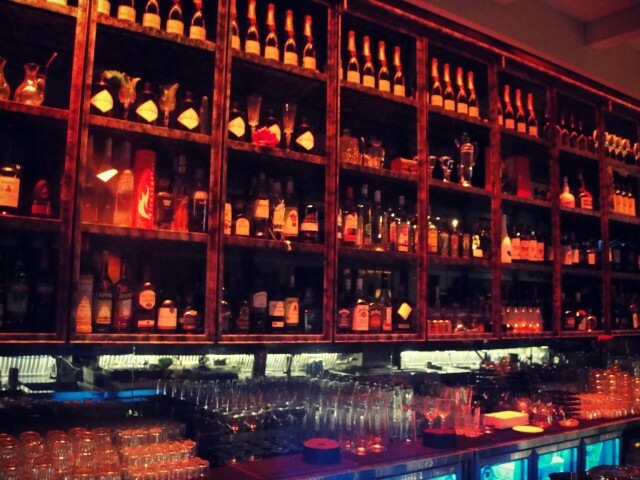 We’ve got a list of lounges that are definitely worth a visit when you’re looking for a nice night out on the town. Expect prices to be high, but you pay for what you get — and these are some of the finest lounges in the city. Cocktails will cost you around 350 NT, while a full meal might set you back 500 NT. This is the place to dine and drink and a great choice for throwing a birthday party (or any gathering!) in lavish style. Unfortunately, it’s not always the best place to go if you’re looking to mingle, as people often come in groups. Marquee features a large main room, decked out in royal purple decor, complete with a long fully-stocked bar. While the lounge is on the spacious side, you probably won’t feel it as Marquee attracts large crowds and the room fills up fast. Apart from their selection of drinks, Marquee also features a menu of Italian and American food – pretty standard offerings, but try their chicken wings or pasta and you won’t be disappointed. Barcode is one of the top destinations for all the party-goers coming to Neo19. Located on the fifth floor, this lounge draws crowds with its classy decor, warm environment and well-dressed patrons. Don’t try coming here in a T-shirt! Collared shirt for guys and dresses for the ladies are recommended. The bar and booths are often crowded, so make a reservation, especially if you plan on coming during the weekends. Venture out to the balcony to catch a great city view. Or play a game of pool, or catch the latest sports scores on the big screen TV. Not sure what to drink? Trust the bartenders to show you their best mixing skills and concoct something delicious. Don’t mind the tight security, especially around the VIP area — we’ve heard many celebrities frequent this lounge, so try and catch a glimpse if you dare! FiFi is known for its stylish restaurant (named one of the top 10 restaurants in Taipei! ), but go up one more floor and you will find a fusion lounge bar called W. The three story complex belongs to Isabelle Wen, a fashion guru — so prepare to be impressed by the beautiful interior design. The lounge bar is a bit of East meets West, and there are antiques from from Wen’s own personal collection and a chic bar on the other side of the room. W bar is frequented mostly by young professionals in their late 20s. The atmosphere is very laid back, with comfortable sofas for lounging, and the vintage decorations will make you feel as if you’ve stepped out of Taipei to a different time and place. The bartenders often experiment with their skills to make exclusive cocktails, so be sure to ask about their new drinks. It might be called InHouse, but this upscale lounge features ample outdoor seating, in a beautifully lit up area. The perfect spot for viewing neighboring 101 when the weather is warm. Too cold to sit outside? The indoor area is also nice and spacious, although it can get a bit packed near the bar. The music here is mostly electric/techno. They have a good selection of beer and wine, which is often served in bulk, so we recommend coming here with larger groups. Pronounced Element, this lounge is also located in Neo19, on the first floor. LMNT offers two choices for your night out: dining and drinking. Split into two distinct rooms, one is perfect for having a nice sit-down meal together with friends, while the other is a drinking area with a bar. When it gets a little later, the dining area is open for those who want to drink too, but we actually prefer the drinking area, where we can lounge one of the comfy sofas. There is a minimum charge for the tables and sofas, so unless you come with a larger group, you might want to stick with finding a seat at the bar. The bartenders here are always trying their best to impress, so grab a seat and watch them work their magic. Look out for specials — LMNT sometimes offers buy 2 get 1 free cocktails. Classy???? More like douchey with horrible music. Hey there, we’re sorry you don’t agree. What are some of your favorite lounges or bars? We’re always looking for new spots to check out. Maybe we’ll even feature it on the site! For real legitimate cocktail experience, the first bonafied speakeasy in Taiwan… Ounce (award winning bartender from NY, owners from NY – liquor things you cannot get in Taiwan). I would say, Ounce is the best you will find in Taiwan. Guaranteed. Classic to vintage cocktails, I’ve struggled finding this in Taiwan, especially after living in LA/SF and having a sister who works in the restaraunt biz at the best bars in NY. Ounce was pretty pricey for the amount they give you even if you compare it to the ones in NYC. Yes, the drinks were good, but at the end of the day, there’s a lotta fru-fru nonsense. Also, the clientele is a pretty insipid bunch I must say. The drinks are all NT$400 (unless you get those champagne ones), you might need to know that for first-timers cos they forgot to put the price on the menu like a real bar. We didn’t have any reservation and we got in no problem. Besides, the place was basically empty.